Thanks to human selection and breeding, the physical appearance of dogs varies tremendously. Using only physical attributes as a guide, it’s safe to say that most uninformed biologists would have a hard time believing that a Chihuahua and a great dane were from the same species, let alone that they were capable of producing viable offspring together. In order to facilitate such dynamic intraspecies diversity of canines, people have long used random genetic mutations to their advantage. One example is the selection for various forms of dwarfism. Breeds such as the dachshund, corgi and the Basset hound have been created through selective breeding of individuals with a genetic mutation of the FGF4 gene that when inherited from one of their parents, leads to the characteristic short legs of these breeds. While a mutation for dwarfism is an expected standard for some breeds, it can be particularly undesirable in others. 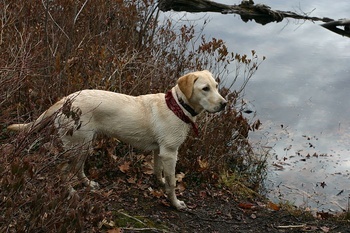 A prime example of an undesirable mutation (especially for working dogs) is a mutation in the COL11A2 gene that causes a generally mild disproportionate dwarfism in the Labrador retriever known as skeletal dysplasia 2 (SD2). Disproportionate dwarfism is characterized by one or more body parts being smaller in comparison to overall size. Dogs inheriting SD2 develop legs that are shorter than the recognized breed standard despite a normal sized body. Most commonly, front limbs are more severely affected than hind legs with this disorder. The ulna and radius bones of the front limbs may also be slightly more bent in comparison to normal dogs. International breed standards established by the Fédération Cynologique Internationale for the Labrador retriever state that shoulder height in males should be 56-57 cm and 54-56 cm in females. Most male dogs with SD2 are under 55 cm at the shoulder and females are often shorter than 50 cm. However, this disease is variable in its physical presentation with some affected dogs from large Labrador blood lines overlapping with unaffected dogs from smaller blood lines. Skeletal dysplasia 2 should not be confused with another disorder known as retinal dysplasia/oculoskeletal dysplasia (RD/OSD) that is also inherited in the Labrador. Unlike the mild physical changes in SD2, RD/OSD is responsible for blindness and limb deformities; characteristics we witnessed in a Labrador named Frank during a recent visit by Paw Print Genetics to an animal sanctuary for special needs dogs. RD/OSD often leads to early onset arthritis due to abnormal bone structure and the effect on joint surfaces of affected dogs. This contrasts with SD2, which does not appear to increase likelihood of early onset joint problems and does not cause vision problems. It appears that Labradors from “working” or field blood lines are more likely to inherit SD2 than Labradors from “show” blood lines. The mutation has been linked back to a male ancestor of the field Labrador blood lines that was born in 1966 and likely acquired this mutation randomly during development. A popular sire due to his success in the field, this Labrador was responsible for spreading the mutation to later generations; a commonplace scenario often referred to as “popular sire syndrome”. Given that most dogs affected with SD2 are bred for working, any mutation resulting in decreased physical prowess in the field (such as short legs) would be particularly undesirable. Given that the inheritance pattern of the disease and the mutation responsible are now known, Paw Print Genetics has developed a genetic test to identify SD2 carrier and affected animals prior to breeding. By testing dams and sires, breeders can make informed decisions about which dogs to breed in order to prevent puppies from inheriting this condition. If the parents have not been tested, puppy buyers should request to have puppies tested prior to purchase. The vast diversity of the canine population is a symbol of our relationship with dogs and the immense variety of tasks that we’ve asked them to perform for our species. Dwarfism is a good example that not all physical traits are praised equally in every breed. However, with modern genetic technologies, Paw Print Genetics can help both our working dogs and their human employers maximize their overall potential, by making sure puppies are born free of undesirable inherited traits and diseases.